She is standing next to the dress that my Grandmother wore during the time she was in Oederan. She never took it off and every week she would bend over and the Nazis painted an X and stripe down her backside. 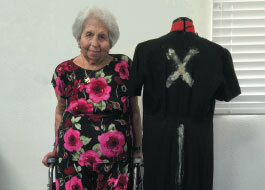 The dress was initially given to her in Auschwitz. Future plans are to find a museum for this dress so that it can be displayed accordingly for all to see and remind us to NEVER FORGET. 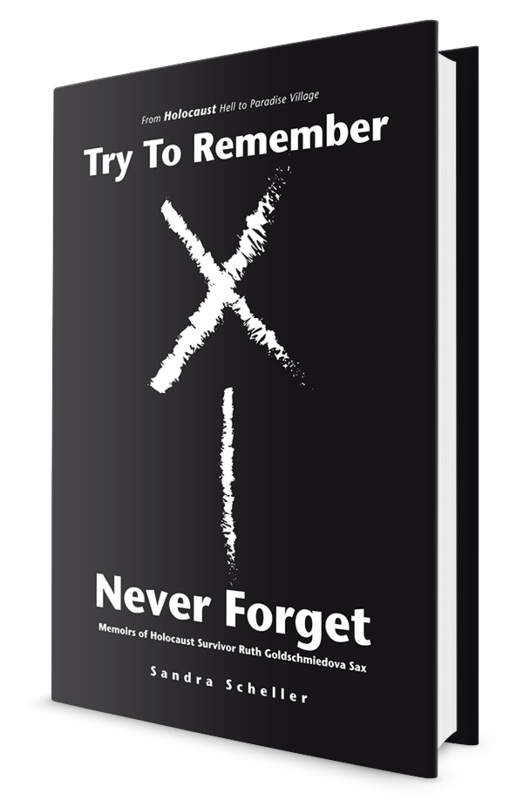 This touching memoir is a look back at the life and times of Ruth Sax, who as a child, comes of age during WWII. The separation from her father, the years of stay in the concentration camps, enduring bathing in soup kettles, completely shaved, faced Dr. Mengele 6 times, watched beloved family members killed before her innocent eyes then surviving the greatest liberation in the history of the world are only some of the harrowing experiences the author’s mother had to go through before she found love and happiness in the USA. It was all done with one word: HOPE.